The Emir of Ngelzarma in Fune Local Government of Yobe State, Alhaji Mahammadu Mai Yeri Ibn Isa II, is dead. 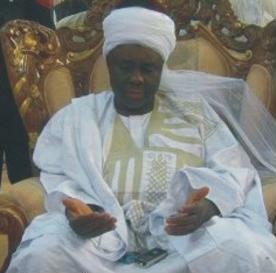 The first class Emir was reported to have died in a ghastly car crash in Gerei, in Adamawa State. The Secretary of the Emirate Council Alhaji Abubakar Ibn Mai Yeri, who confirmed the death to newsmen in Damaturu, informed that royal father died in an auto crash which occurred around 2:00p.m., Monday afternoon. Aged 49, the royal father was survived by two wives and 13 children. It was gathered that his father, whom he succeeded, also died in an auto crash on Damaturu/Maiduguri highway. In August 2012, A suicide bomber tried to kill the Emir but failed. The bomber was noticed trying to get close to the traditional ruler. A policeman attached to the Emir however barred the bomber. Seeing that he might end up being prevented from achieving his aim, the bomber brought out a gun which had been concealed in his clothes. The bomb on him however exploded before he could open fire. This entry was posted in News and tagged Alhaji Mahammadu Mai Yeri Ibn Isa 2, Alhaji Mahammadu Mai Yeri Ibn Isa 2 Is Dead, Emir Of Yobe State, Is Dead.